Compare the number of students in a typical classroom to the number of employees in the average office space of the same square footage and you’d find the density in schools is 3 times higher. Bringing in the proper amount of outdoor air and delivering it to each space efficiently can be a challenge. Couple that with the varying uses and activity levels of each classroom and there can leave a high potential to save—or lose—ventilation costs on each classroom. 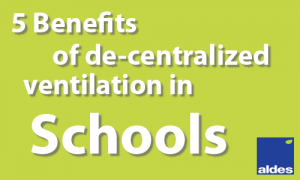 De-centralized ventilation systems, in which each classroom or zone can be managed separately by a light commercial heat or energy recovery ventilator, can have some big benefits. Here are a few worth considering. Demand-based ventilation. Classrooms may be filled with students from 8 am to noon two days per week, and full the entire school day on the other three days. Rather than running at full ventilation rates on all 5 days, districts save money by ventilating only on the days and times it’s needed. Flexible maintenance schedule. De-centralized ventilation systems use smaller heat or energy recovery units that can be maintained without shutting down ventilation to the entire building; only the classroom or zone it manages. Facility staff can plan on performing maintenance during the school day when students are at lunch or other activities. Simple to control and balance. It’s simple to implement a control strategy with light commercial heat or energy recovery ventilators since the system is not dependent on VAV systems. Even better, since the ventilator is dedicated to one classroom or zone, there are no long duct runs, and balancing is quick and easy with only 1 (or a few) connection(s) per fan versus central systems which may have dozens of connections per fan. Convenient access. Select light commercial heat or energy recovery ventilators are small enough to fit above drop ceilings, so they can be accessed easily without the liability and weather-related challenges of accessing a rooftop or dedicating space in a mechanical room. Improved motor performance. All American Aldes light commercial heat or energy recovery units have direct-drive backward-inclined motors for improved performance and reduced maintenance since there are no belts to maintain or change. Only Aldes makes light commercial heat and energy recovery ventilators with plate-type exchangers rather than wheels, so there’s no moving parts and they easily slide out for cleaning; dual side access doors for building maintenance staff to service the unit from either side; and multiple speed blowers built into the unit controls as a standard feature. Aldes light commercial series are simple to install and require no special wiring, just plug them in. While de-centralized systems have plenty of benefits, some districts may prefer centralized systems. Either way, Aldes has solutions with a wide range of heat and energy recovery ventilators just right for schools, from 650 CFM all the way up to 10,000 CFM. In fact, schools across the country are choosing a variety of Aldes HRVs and ERVs for their durability, energy savings, low maintenance, and competitive pricing. Learn more at www.aldes.us/schools.